Many businesses choose to work with independent contractors, which is perfectly acceptable, but are you following the legal parameters? 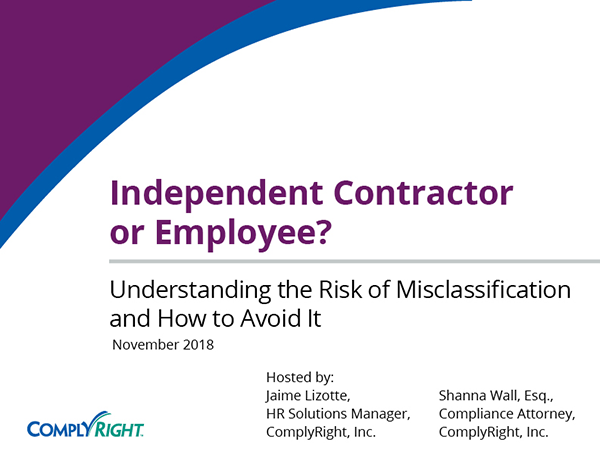 During our post-webinar Q&A session, Jaime Lizotte, HR Solutions Manager and Shanna Wall Esq., Compliance Attorney answer questions on how to properly classify freelancers, consultants, temps and other contract workers. I use freelancers who haven’t signed an agreement. Should I ask them to do it now? Absolutely. A written agreement can help establish that a worker is an independent contractor. But remember, an independent contractor agreement is only useful if you follow it. If you treat a worker as an employee, the contract won’t protect you. What tax filing is required when working with contractors? If you work with an independent contractor, you’ll need to file a Form 1099-MISC at tax filing season. To do this, you’ll need a Form W-9 and a Tax Identification Number or TIN. The contractor provides the Form W-9. It’s a best practice for you to request – and receive – a Form W-9 before any work begins. Can I hire a former employee as a contractor? You can. It’s not recommended that you hire a bunch of former employees. That could be a red flag that you’re trying to get around the system by changing worker status from employee to contractor. But on an individual basis, it can work. Make sure the employee forms an actual company. And make sure you’re paying the company, not the individual. Can my independent contractor use our company truck to purchase supplies? They should use their own equipment. But if that’s the only factor you’re worried about, it probably isn’t a problem. Again, determining status is subjective. You want to make sure there aren’t too many indicators that the worker should be classified as an employee. How did Uber get around the core business function? Isn’t driving the core function? That was likely a point brought up in the lawsuit. Uber doesn’t consider itself a transportation company. It considers itself a technology company that gives drivers access to its app. Plus, Uber allows drivers to work for competitors, like Lyft. It’s a complicated case. But it looks like Uber will be able to continue to classify drivers as independent contractors. Can a worker waive his or her right to be an employee and choose to be a contractor? No, a worker cannot waive his or her employee status. Even if they sign a contract or agreement. The specific criteria of the tests must be satisfied to classify a worker as an independent contractor. Otherwise, the worker is an employee under the law. How long can an independent contractor work for me? There is no specific limit. But a continuing, long-term relationship between the employer and worker could be considered one indication of an employee relationship. What are my options if I have applied the tests and I am still unsure if a worker is an employee or contractor? When in doubt, seek legal counsel or classify the worker as an employee. 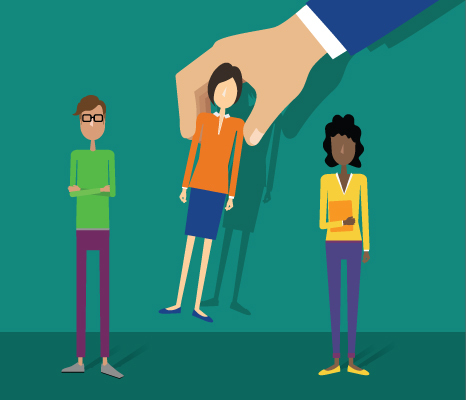 Are you raising a red flag by converting a contractor to an employee? I’ll say no, but Shanna can you expand upon this? Sure. I think what the question is asking though is also will you raise a red flag with the worker? And yes, you may, because they may wonder why you are switching them over. And this could raise a question to them to report it to an agency. However, if you position it correctly, then you could help to eliminate some of the possible concerns.